Dōtonbori(道頓堀) sits at the heart of Osaka, a vastly underrated city situated in the middle of Japan. Everyone who goes to Japan has to go to Tokyo. Frankly, I rarely ever hear of anyone who travels to Osaka for the sake of visiting. More often than not, Osaka is a wayward site that serves as a pass through city or a launching point for nearby UNESCO World Heritage city of Kyoto. However, Dontobori is the equalizer that makes Osaka one of my favorite cities in the world. The Dotonbori entertainment area is essentially a riverwalk, similar to what the 2013 NBA Finals runner up San Antonio Spurs see everyday in their fair city. The Dotonbori river runs through the center of the area and the river is surrounded by buildings that are filled with restaurants, bars, clubs and an assortment of stores. Like in Tokyo, the limited real estate ensures that buildings grow upward rather than horizontally. When the local baseball team, the Hanshin Tigers, finally won the Nippon League Baseball championship in 2003, locals celebrated by jumping directly into the river to celebrate. It is unknown if anyone developed skin rashes as a result of their poorly thought out celebration. Anyhow, here’s why I think Dōtonbori is so awesome. If no one has told you, Dotonbori is a foodie’s dream. 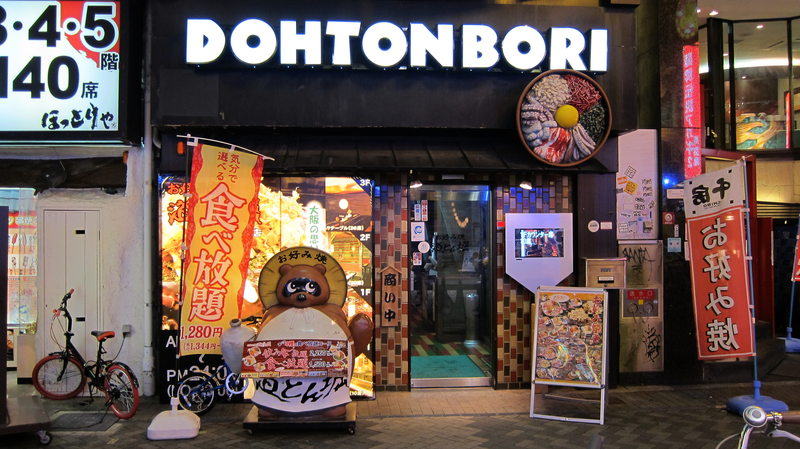 With food prices cheaper than Tokyo and a selection that is second to none, Dotonbori is full of eclectic choices that range from steak restaurants, to traditional sushi, ramen joints and teppanyaki. Unsurprisingly, you’ll also find a lot of Chinese and Korean food as they tend to be popular with the hordes of mainland Chinese tourists that make their way here. As a city, Osaka’s claim to fame is a street side snack known as takoyaki, grilled octopus in a flour and egg based breading that tastes like a cross between a hot pastry and dried seafood. In Dotonbori, you’ll find plenty of vendors who will grill you up a fresh batch on the side of the street. Unlike most other street food vendors around Asia, the sanitation of street food is impeccable and you won’t feel the need to make a beeline to the bathroom afterwards. Corner ramen shop in Dotonbori. Certainly a lot of the cuisine here is focused on quick serve as there tends to be a lot of salary men and students in the neighborhood. Ramen shops and izakayas are aplenty. Just remember to bring cash since credit card is not widely accepted in the country. 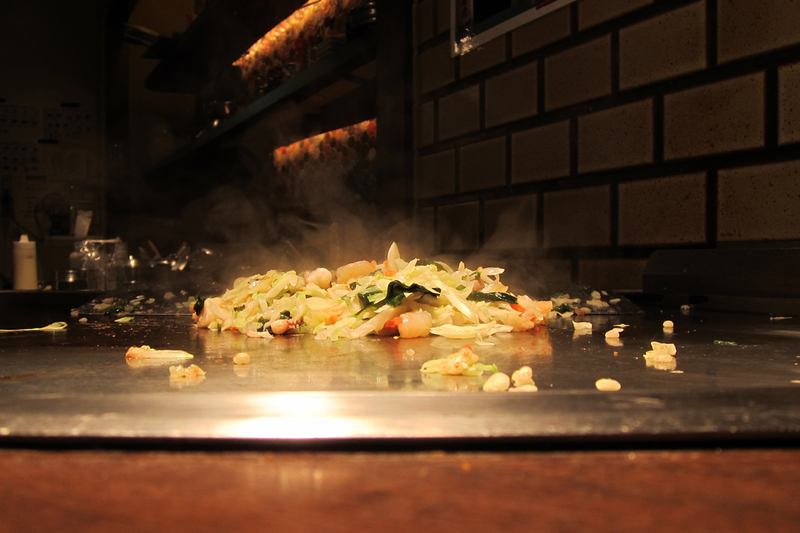 The beginnings of Osaka style okonomiyaki at Dohtonbori(restaurant). The okonomiyaki beginning to take shape. The city of Hiroshima can claim to make the most awesome okonomiyaki, however, the Osakan version is much more prominent around Japan. 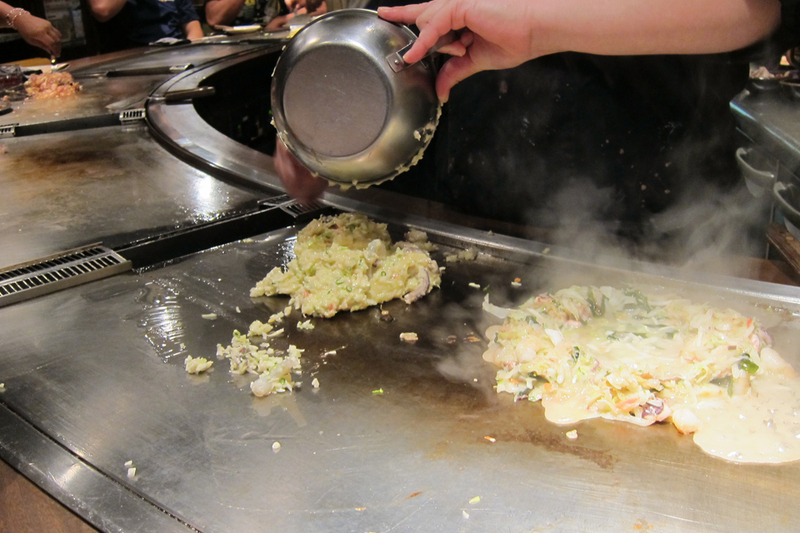 Okonomiyaki is a savory pancake made with a rich batter of flour, nagaimo yam, eggs and shredded cabbage. Additionally, you can have proteins(chicken, shrimp etc) mixed in for added texture and substance. Paired with a cold Asahi, okonomiyaki is a full fledged assault on your taste buds. The pancake is not too salty, not too heavy on the palette, and fully satisfying. 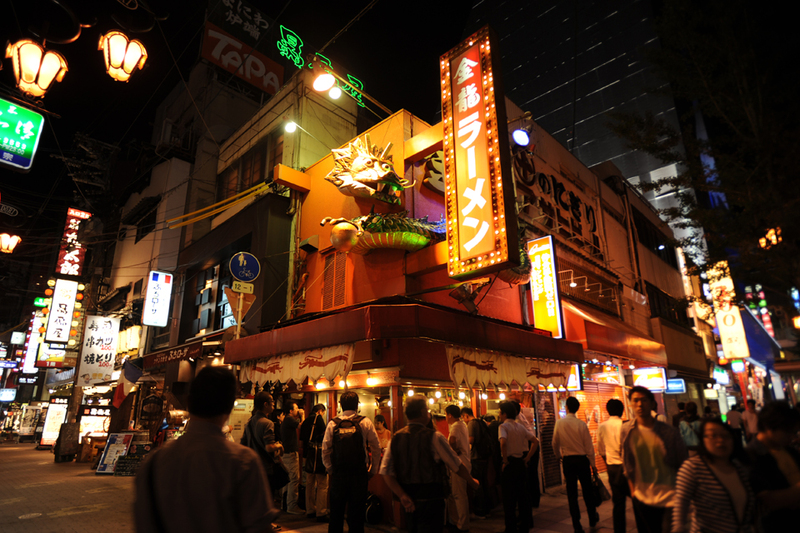 On Dotonbori, there is no shortage of places to try the timeless Osakan favorite. In fact, during my last trek, I ate at a place called Dohtonbori, a really chill place that makes the okonomiyaki right in front of you. If you have a chance, check Dohotonbori out, order yourself an “everything” okonomiyaki, grab a beer and watch them whip it up in no time. Dohtonbori serves Osaka style okonomiyaki. Being efficient with stand up and go ramen. 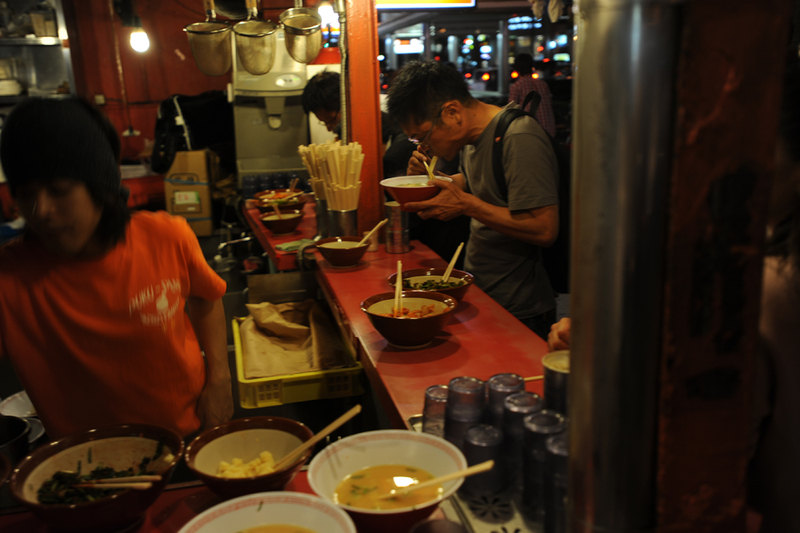 Ramen shops are ubiquitous on Dotonbori. While there are plenty of sit down restaurants, there are also corner shops which will serve you while you stand at the counter. A pretty unique experience for the workaholics out there. The main drag of Osakan nightlife is clustered around the clubs located around Dotonbori and spills over onto both river bank. Parties happen just about every night and things keep rocking till the last person leaves(or the subway starts running again). When TripQue went on a Wednesday night, there were a good number of people at a club called Giraffe Osaka. Giraffe had two floors dedicated to EDM music and a pretty awesome female “hype man” that reminded me of the Pride Fighting Championships’ screaming lady. The biggest detriment is that the clubs and bars only take cash. So make you have a couple ¥10,000 bills in your wallet just in case. To find out what parties are going on any day of the week, check out the iFlyer.tv Nightlife Events Guide in the Kansai region for nightly events. 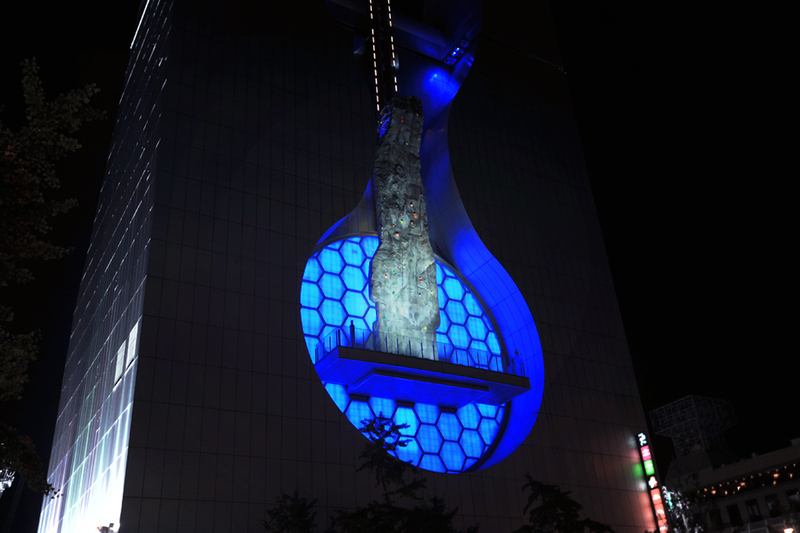 The Namba “Hips” building is a full fledged entertainment complex with bowling alleys, pachinko parlors and various other nightlife activities. If you look closely, the hour glass figure that this building is known for is also a rock climbing wall that hangs over multiple stories overlooking Osaka. Even atop the Umeda Sky Tour in Osaka, which sits miles away, you can see spot the exact location where Dotonbori is. The lights and the sounds are a full on assault on all your senses. The first time I set foot in Dotonbori, I didn’t know which way was up, all I knew was that I liked it. Everywhere you look you will be inundated by light up billboards, neon-lit storefronts and restaurant logos. My best recommendation is enjoy it. Take it all in like you would in NYC’s Times Square. Dotonbori is a rollercoaster ride and you just got in the front seat. The famous Glico man display. 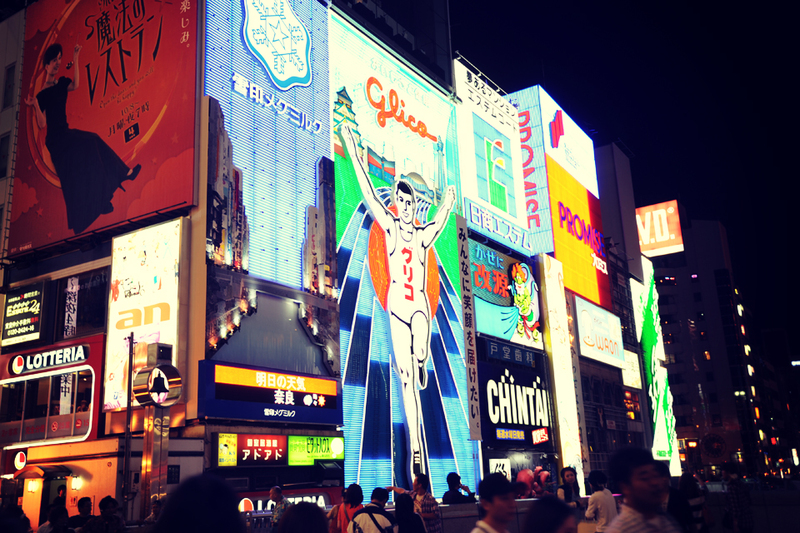 The famous Glico man billboard is a mainstay and an enduring symbol for Dontobori and Osaka. The sign has been part of not only the Dotonbori neighborhood, but also Osaka since 1935. For the curious, Glico is the parent company of Pocky. All I know is that Glico must have sold a a lot of Pocky to afford such a prime location. Hostesses, for better or worse, are a big part of Japanese business culture. My first exposure to the hostess culture came when I stumbled upon the documentary “The Great Happiness Space” on Netflix. It was really interesting to actually see some of the sales tactics that these guys were trying, in order to get clientele. My explanation of what a hostess/host’s job entails would probably not do it justice. Rather, Kotaku’s article will provide a bit more depth into the day to day lives of these night workers. 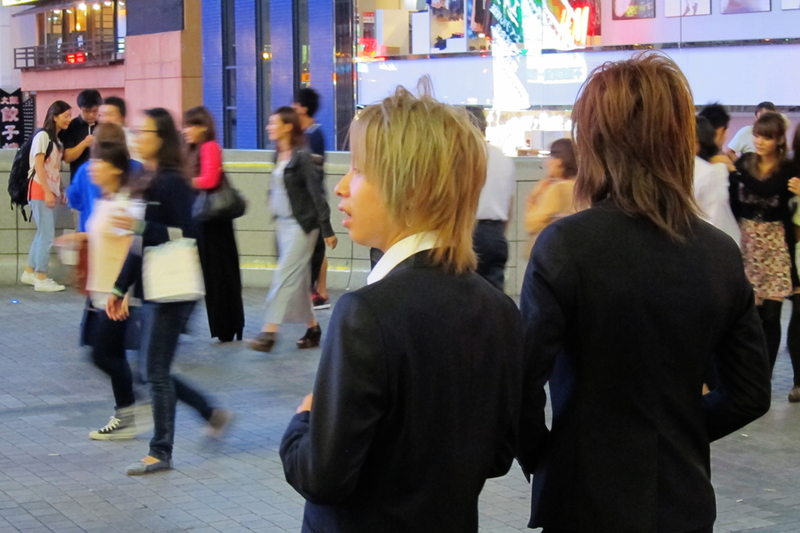 In Dotonbori, you’ll see plenty of these hostesses/hosts constantly on the prowl for potential customers. Interestingly enough, I was never approached by any of these hostesses. But I’m pretty sure that they are experienced enough to separate out the locals and the tourists just by looking at them. Hostesses and hosts trying to find new and willing customers. Hosts working hard for that money. On the prowl for middle aged housewives. The humanity that spills over onto the sidewalk on any given night can leave you a bit claustrophobic. But the difference between crowds here and in China is that people here are definitely more considerate. I didn’t find the need to stiff arm any old ladies in the face as they jostle for positioning. In a way, it’s almost controlled chaos that adds to the overall charm of the area. In fact, we can even say – Dotonbori is poppin’. Osaka is home to some pretty eclectic fashion. While not as flamboyant as Harajuku in Tokyo, the people here definitely have adopted a different way of dress. 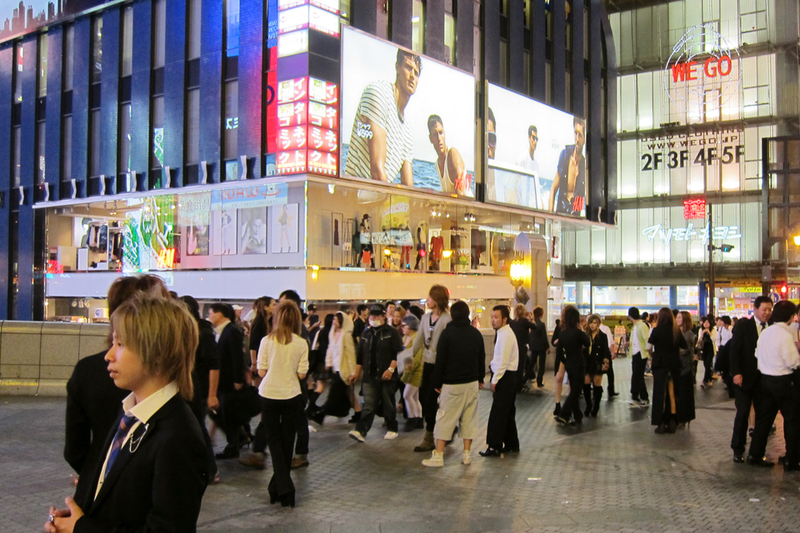 Dotonbori is a great place to people watch. In fact, I recommend grabbing yourself some takoyaki balls, plotting down on a bench and people watch. I don’t know who thought of this name, but damn, they must have gotten a marketing degree somewhere. I’m half expecting a glut of tentacles and heavy leather to adorn the walls, but despite the misleading name, it turns out this is a yakiniku place that lets you grill your own beef(there is a pun there somewhere). For the curious, here is a Japanese review that tells you more and gives you the actual physical address of the restaurant. Someone want to go and give us a review of this place? 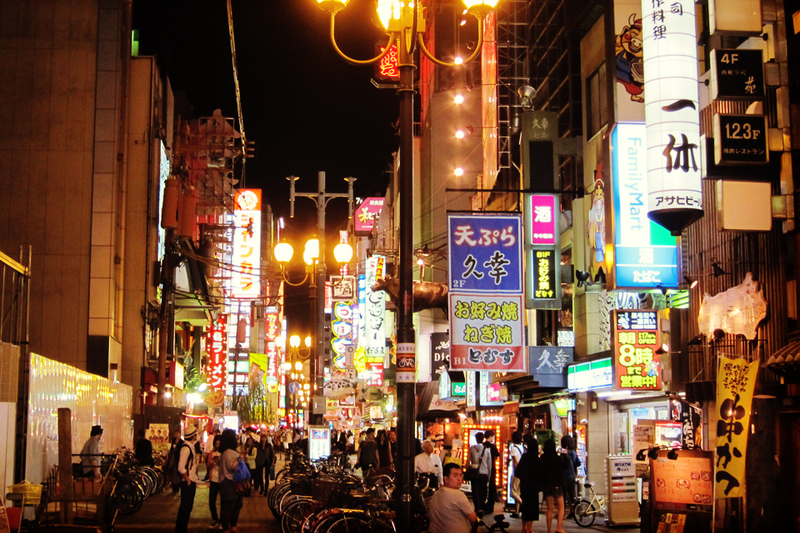 Dotonbori is located towards the south side of Osaka, conveniently served by the local subway. To get to Dotonbori, you have a couple of choices. 1) Take the Midsosuji Line(red line) and exit out of the Nanba station. Dotonbori will be a few blocks north of where you exit. 2) Take the Sennichimae Line(pink line) and exit out of either the Nanba or Nipponbashi station. If exiting out of Nipponbashi, walk north and you hit the east side of Dotonbori. 3) Take the Sakaisuji Line(maroon line) and follow the signs north to get you to the east side of Dotonbori. 4) Take the Modsosuhi Line(red line) and exit out of Shinsaibashi. 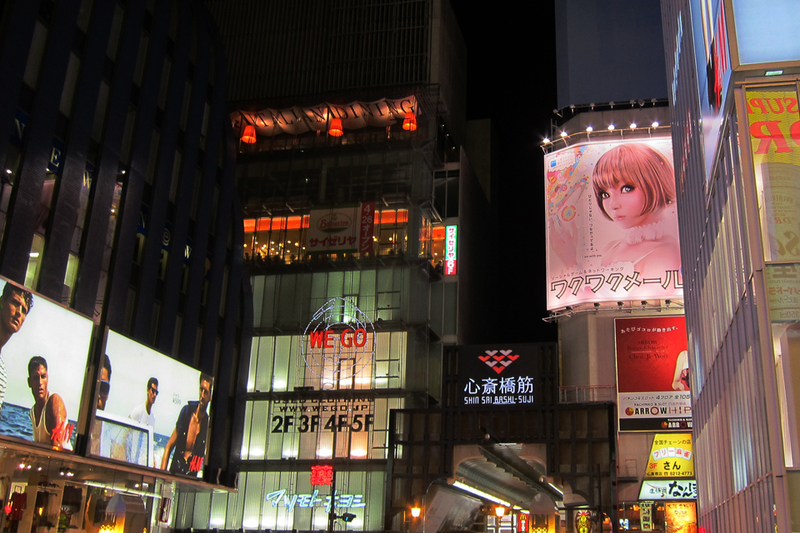 If you walk south, you’ll walk by a ton of high end shopping before hitting Dotonbori. Did you know Yoshinoya serves gourmet food? ← Did you know Yoshinoya serves gourmet food? Yeah! I really feel that Osaka, as a whole, is really underrated. There’s a certain vibe that Osaka has that Tokyo is lacking. Definitely one of my favorite city(and places) during my trek out to Japan.